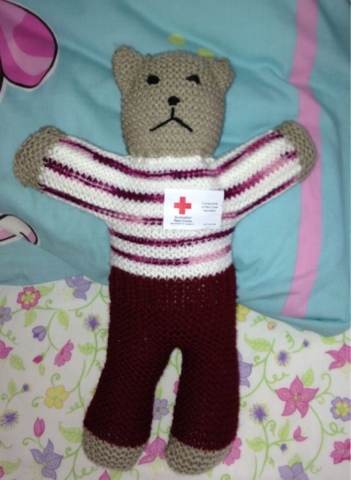 Thank you to the Red Cross Volunteer who took the time to knit this little bear. Stripes, as he has been named, helped calm Paige and keep her company when she was unexpectedly admitted to hospital on Saturday. I'm not the type of person to rush to the doctors and it's incredibly rare for me to go to the emergency department, so it never crossed my mind that the stomach pain Paige was experiencing could be an appendicitis. She played netball and then came home and did her chores! The poor girl looked so awful I finally Googled the symptoms of an appendicitis, then I quickly bundled her in the car and took off. I knew I was right when the triage nurse had us in with a doctor within 10 minutes. 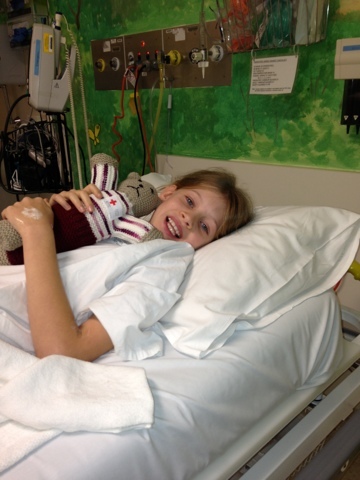 She had surgery within 24 hours, everything went really well and she's now recuperating at home. The public hospital system gets a lot of criticism, but I have nothing but praise. The surgeon, doctors, nurses and all the other staff were just amazing. So thank you to the Red Cross Volunteer and a huge thank you to all the staff at the Monash Medical Centre. There was quite a bit of pinterest planning done while we were in hospital so there should be some sewing to share soon. Caitlyn has a thing for beat up old VW Kombi vans so when I saw this fabric on the Tessuti website I couldn't resist. I wasn't sure what I was going to make and at $40 a meter I could only afford to purchase a single meter. I don't usually spend a lot of money on fabric for the kids clothes because there's no guarantee they'll wear it, even when they've asked for it. After a bit of discussion Caitlyn chose view A of Butterick 5786, a button through shirt with hem detailing. I was just happy that I'd bought the smaller size range so I didn't have to do any grading. I made a straight size 8 and cut 18.5cm off the back length of the shirt. I had planned on smoothing the side seams to retain the rounded look but Caitlyn liked the squared corners so we left it that way. Of course once it was finished she tried to tell me she actually wanted it to have a collar and stand, but there was no way I was unpicking and adding in a collar. By the time I did that this wouldn't have fit her at all. As it is I'm not sure how much wear she's going to get out of it, the weather is starting to cool down in Melbourne and it won't be long before winter hits. At the rate she's growing I doubt it will be long enough next summer! I'm always late to the party when it comes to popular patterns and this time is no different. The incredibly popular Vogue 1027 is one of my last summer sewing projects. I'm a bit skeptical when people say that a pattern runs big - too many times I've been left feeling enormous (because I've had to make my usual size) or with a garment that is too small. I usually make a 14 in Vogue patterns, but due to the stretchy nature of my ITY jersey I had planned on going down to a 12. Of course I'd bought the larger pattern range which started at 14. How big could it be? I'm willing to admit I was wrong. This sucker has an enormous amount of ease. I took out over an inch from each side seam just to get a relatively close fit. It's only due to the weight of the skirt pulling the dress down that it looks as fitted as it does. I could easily have cut a 10, maybe even an 8. I've started looking at pattern pieces to see if there's anything I can simplify. This time I cut the tie as one piece and sewed it in half angling the ends. I was very concerned about the neckline gaping or the shoulders stretching out, so I used seam tape on the shoulder seams and the front neckline edges which worked really well. Mid length dresses and skirts look great on some people, but I'm not one of them, so I lopped 4 inches off the skirt hem. I usually like to eliminate facings generally top stitching with a twin needle instead. This time that didn't work - it just made the fabric look terrible - so I've used the sleeve facings and left the skirt un-hemmed (sorry Mum). I think you all know how much I love Simplicity 3686, I've lost count of the number of times I've used it. This weekend I finally managed to finish my second pair of shorts (I cut them out way back before Christmas). I'm not even sure why I put them aside for so long I only had to finish the waistband and hem them. No modeled shots but they're identical to these ones. I love the pockets and the contrast facing. I made this navy pair late in January and they're getting nearly as much wear as my black pair. My only regret is not using better fabric. I really wanted navy and the only navy fabric I could find was a cotton drill (with no stretch) from Spotlight. These would have been nicer made up in a fabric with a little stretch and recovery. After a long day at my desk they're all wrinkly and quite baggy at the knees. Oh well, I still reach for them regularly. I'd love to make a couple of pairs in a nice stretch wool for winter, but seeing as I don't have the budget to buy more fabric at the moment, I think I'll put this pattern away for a while and start searching my fabric and pattern stash for other autumn/winter projects. Do you have anything planned for autumn/winter (or spring/summer)?